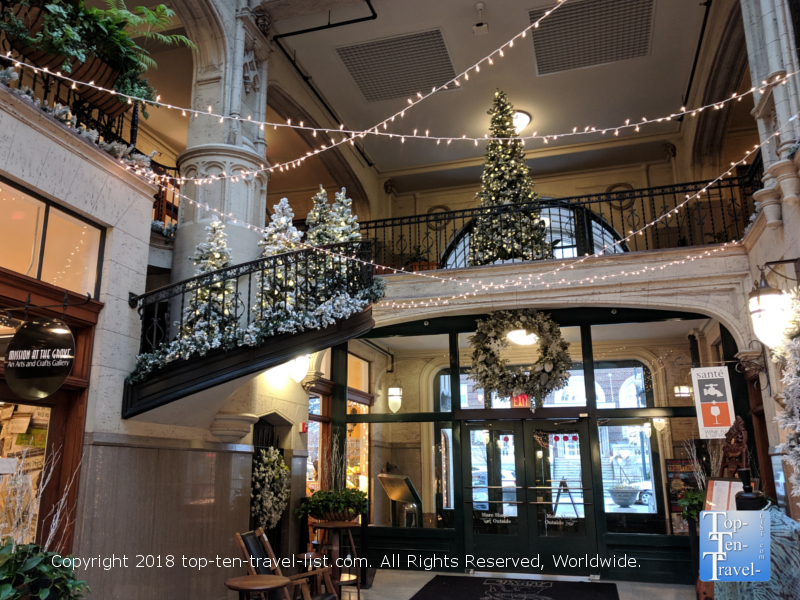 10 Things to do Over the Holiday Season in Asheville, North Carolina - Top Ten Travel Blog | Our experiences traveling throughout the US. 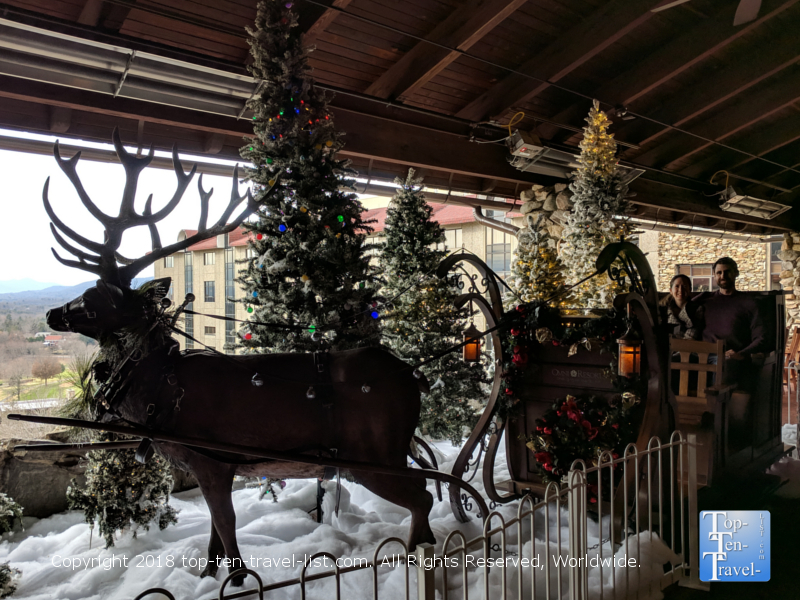 Between the country’s largest gingerbread competition and the renowned holiday celebration at the historic Bitmore Estate, Asheville has become a popular Christmas destination in recent years. 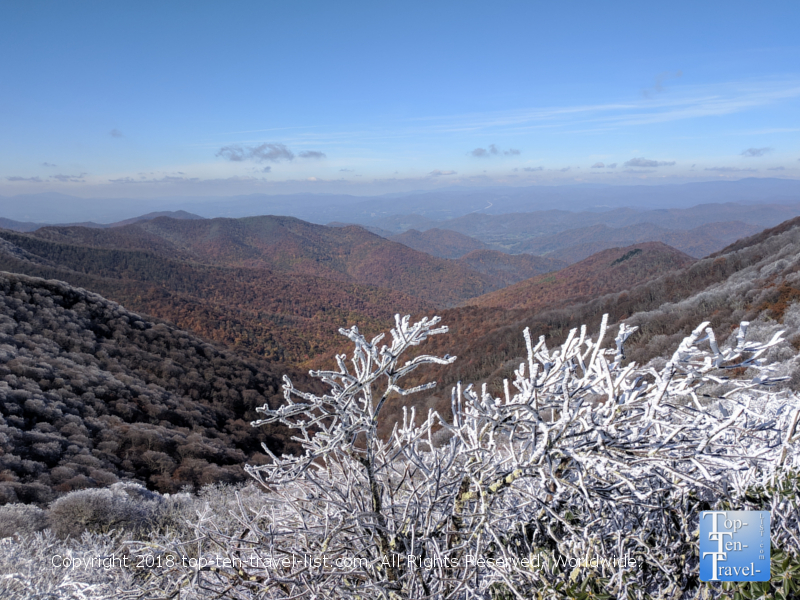 Add in a small chance of an early winter storm, a lineup of festive events, and a multitude of winter recreational opportunities nearby, and it’s really no surprise that more & more people continue to flock to Asheville to celebrate the holiday season in the beautiful Blue Ridge mountains. Below are 10 festive ways to get into the Christmas spirit this holiday season in Asheville. Now in its’ 26th year, the extravagant National Gingerbread Competition at the Omni Park Grove Inn continues to wow guests who travel far and wide to view the exquisite handcrafted pieces which are 100% edible and 100% creative. 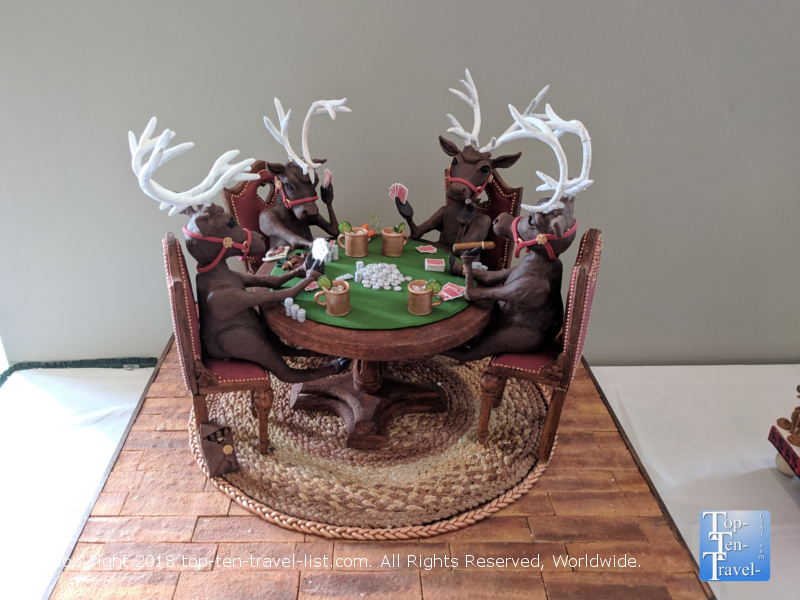 You may have seen typical gingerbread displays before, however, few can compete with the shear creativity of the gingerbread pieces featured in this beloved annual tradition. Hundreds of talented artists across the country compete for the prestigious title, with 2018’s winner creating a unique rendition of Santa’s workshop. Every creation really is extraordinary and you will get to see dozens of gingerbread houses, all with a unique theme. The judging process is fierce with both creativity and construction taken into consideration. The prestigious judging panel this year includes top pastry chefs from shows like Top Chef. This event runs the entire month of December and guests not staying at the resort are invited to view the various entries on select days. 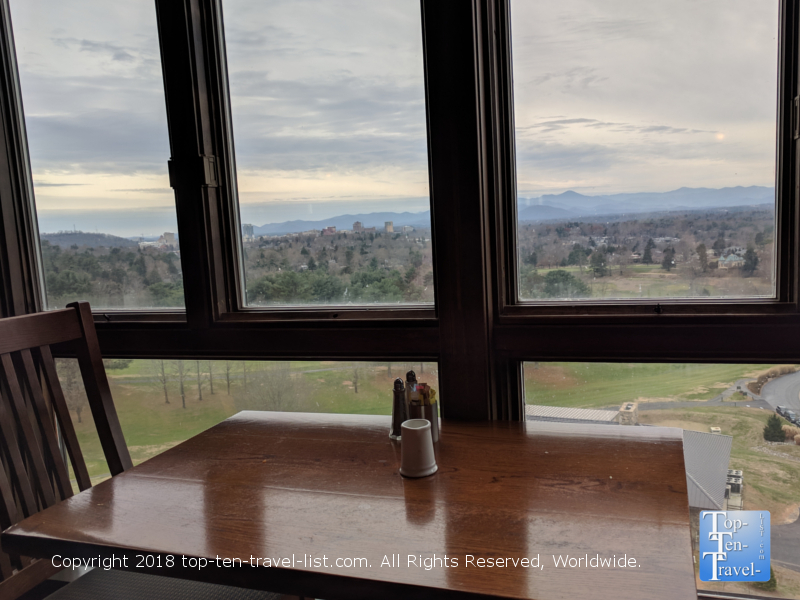 A $20 parking fee is in place, although quite worth it, particularly if you enjoy other on-site activities like brunch in the gorgeous Blue Ridge Artisanal Buffet dining room which is lined with floor-to-ceiling windows looking out over the serene Blue Ridge mountains. 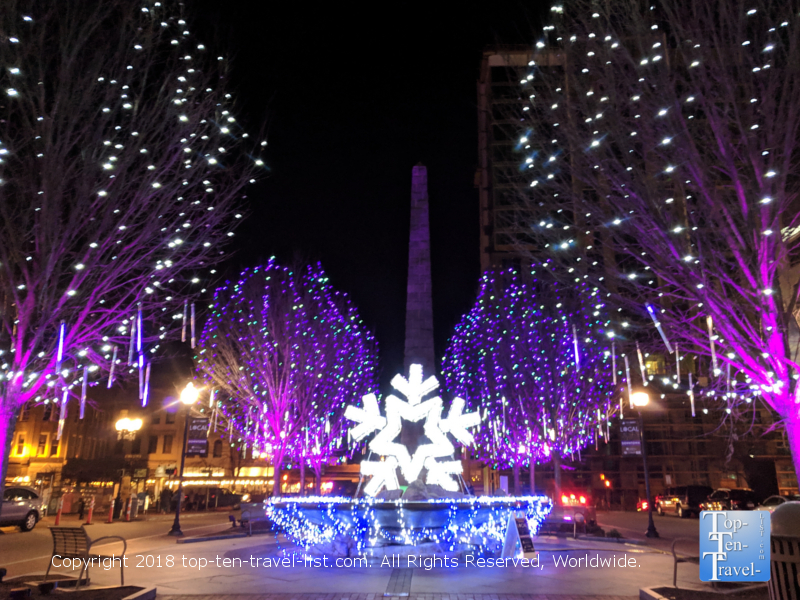 Although not quite as impressive as the big city Christmas light displays, Asheville continues to add more color to the streets of downtown with each passing year. New for 2018, the city has put up several decorations from the well-regarded Winter Lights display at the North Carolina Arboretum. Plan for an evening strolling around downtown. Grab a hot cocoa or coffee from one of the great local roasters, shop for unique Christmas gifts at the Mast General Store, enjoy the lovely lights, and cap the night off with a great dinner at any of Asheville’s well-regarded foodie establishments. 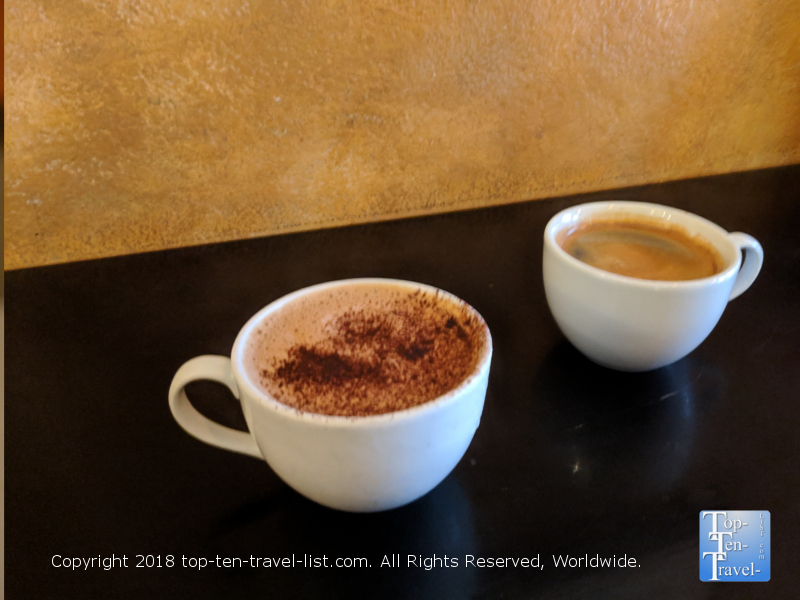 A few great dining choices include: Tupelo Honey (creative Southern style entrees & a nice ambiance) Laughing Seed (tasty vegetarian food ), Blue Dream Curry House (excellent UK style curries). If you prefer to avoid the hefty downtown crowds, opt for a quiet dinner at Vinnie’s – Asheville’s best Italian restaurant. Bitmore Village, a quaint historic shopping and dining area just a few miles outside of downtown Asheville, is a great place to spend a few hours. The village is decorated beautifully over the holidays, and thus, the ambiance is just perfect for Christmas shopping. Mark your calendars for the annual Dickens Christmas Celebration, featuring old-fashioned Victorian carolers, live entertainment, a special craft market, and an old-time photo booth. 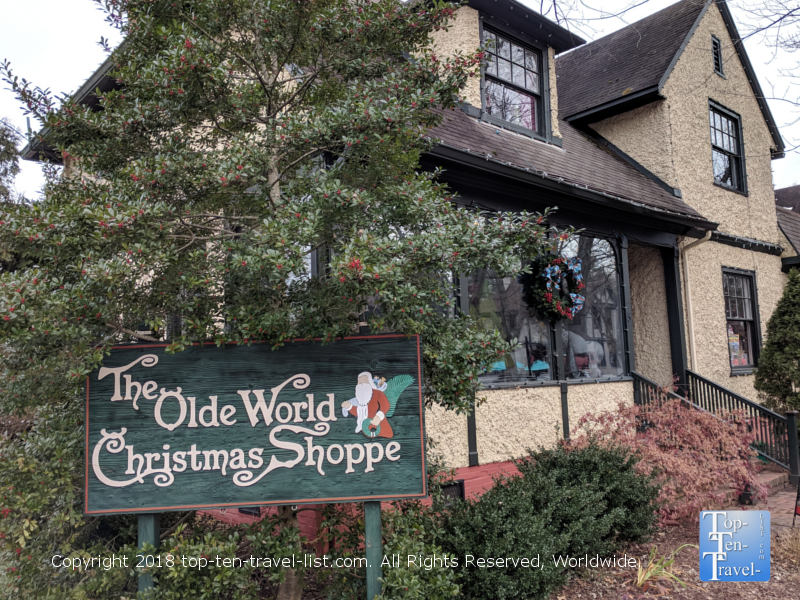 A few highlights in the Village include Corner Kitchen (the best breakfast restaurant in Asheville), the Olde World Christmas Shop (gorgeous Christmas ornaments and decor), and Village Antiques. The Grove Arcade is an upscale local dining and shopping complex housed in a historical building built in 1929. 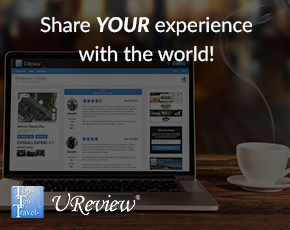 The Grove is known as an architectural jewel with its’ stunning ornate sculptures. During the holiday season, the Grove is transformed into a Winter Wonderland with gorgeous decor, several gingerbread houses from the Omni competition on display, and ongoing festive events including visits from Santa Claus. While you are here, there are a number of local boutiques to check out. If you want to relax for a bit, head over to the Battery Park Book Exchange, where you can scout out some new literary treasures while enjoying a cup of coffee or glass of champagne. Note: multiple signs informing customers not to read books before purchasing is a bit over-the-top, however, it’s still a nice place to enjoy a drink in a cozy atmosphere. It’s not rare to see an eager line standing outside the door to enjoy a delicious handcrafted specialty cocoa at French Broad. Really, nothing is more comforting on a cold winter’s day that a relaxing mug of hot chocolate. 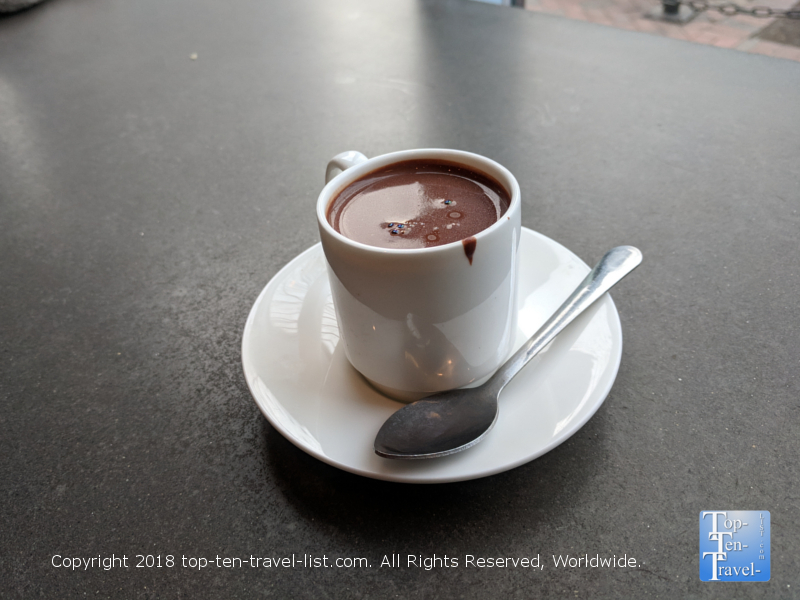 Both traditional and European style drinking chocolate in various flavors, including salted caramel, dark chocolate, and vegan Buddha, are available. They also serve delicious desserts and creamy gelato. So after a few hours exploring downtown Asheville, take a break, give your feet a much needed rest, and enjoy winter’s classic treat. For a real indulgence, cocoa lovers must try out one of the liquid truffles – it’s like a shot of pure chocolate – the most indulgent treat in town. Grab a seat by the window, watch all the action downtown, and savor your chocolaty drink. Note: Be forewarned – service is very bad and leaves much room for improvement. The best breakfast experience in Asheville is found at the luxurious Blue Ridge Artisanal Buffet, the on-site breakfast restaurant of the gorgeous Omni Park Grove. Although quite pricey, it’s definitely worth the splurge for the diverse food assortment and amazing vistas of the Blue Ridge mountains. A number of specialty holiday brunches are offered, although these tend to sell out weeks in advance. Although these seasonal brunches are upwards of 50 bucks per person, if do not mind splurging on a nice holiday meal, it’s really one of the best dining experience in the region. The breakfast buffet is the best value at just $25 per person. The buffet features all your standard fare, along with a made-to-order omelet station, a delicious chia pudding bar, an oatmeal bar, fresh squeezed juices, and a doughnut bar. 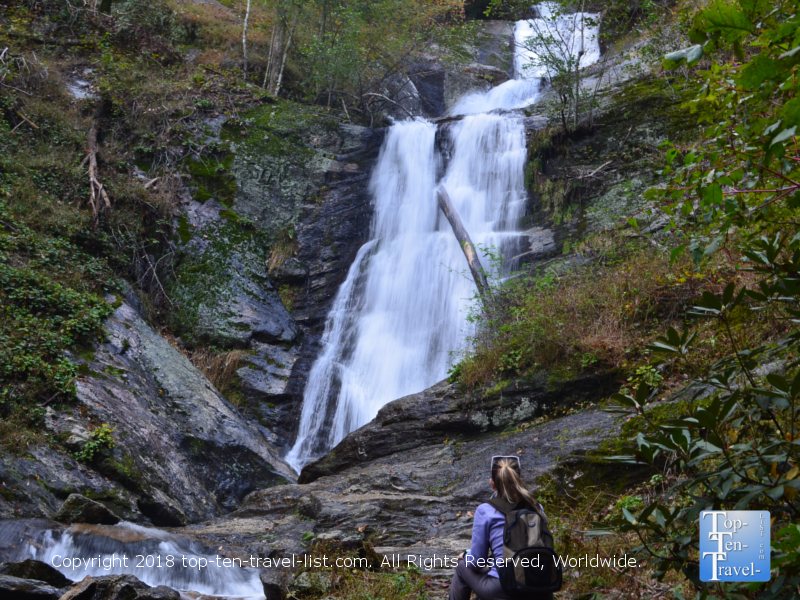 Winter is a fantastic time to explore all the beautiful waterfalls and trails of Western North Carolina. 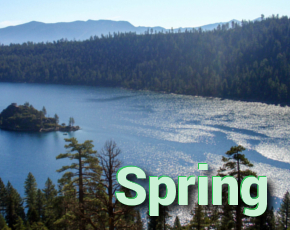 As this region is home to more than 200 waterfalls and 100’s of miles of trails, there really is no end to the available recreational opportunities. As crowds begin to taper off this time of the year, the trails are much more peaceful, and also the parking much less of a hassle. A few breathtaking options within an easy drive of Asheville include Catawba Falls (a stunning 100 ft waterfall just a half hour away), Tom’s Creeks Falls (an underrated 2 tiered waterfall about an hr from the city ), and the Triple Falls trailhead (a mile long hike to 3 incredible water falls located just an hr away). These options are all perfect for the winter season and pretty easy to get to as they are not located on the Blue Ridge Parkway, which is often closed due to snow and/or ice. Skip the run to Whole Foods or Home Depot and instead opt for a scenic ride out to a local farm. Enjoy the fresh country air and the nostalgic trip down memory lane as you search for the perfect Christmas tree at a real working farm. 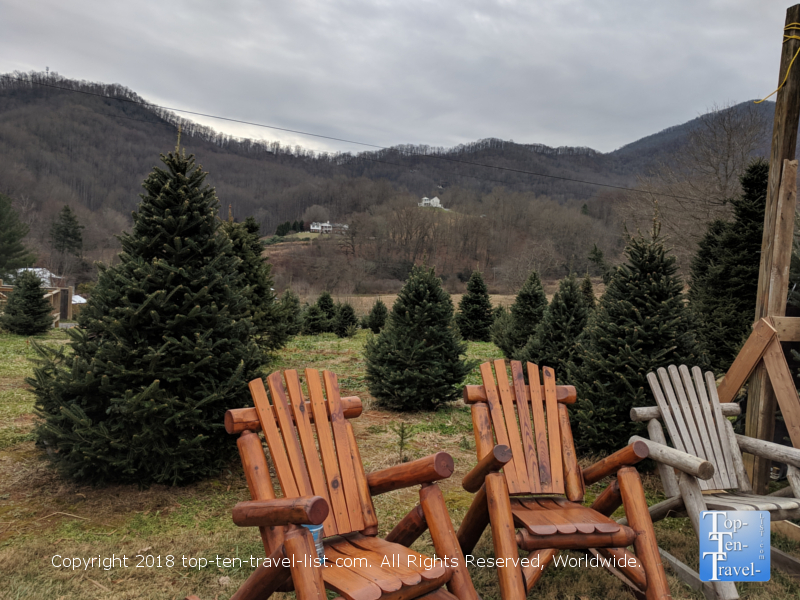 There are several Christmas tree farms within an easy drive of Asheville, although the trees tend to sell out really fast in this area so you must plan ahead. If you are looking for a more rustic experience, check out a Choose N Cut Farm like Boyd Mountain in the charming small town of Waynesville. If you are looking to keep it simple, Smoky Mountain Christmas Tree Farm (also in Waynesville) is a nice choice as well. The half hour drive is so rustic and beautiful, and the farm itself quite beautiful with the Blue Ride mountains comprising the backdrop. This beauty is located right in town and it’s completely free to visit! The Asheville Botanical Gardens is a non-profit dedicated to preserving plants native to the Southern Appalachian region. 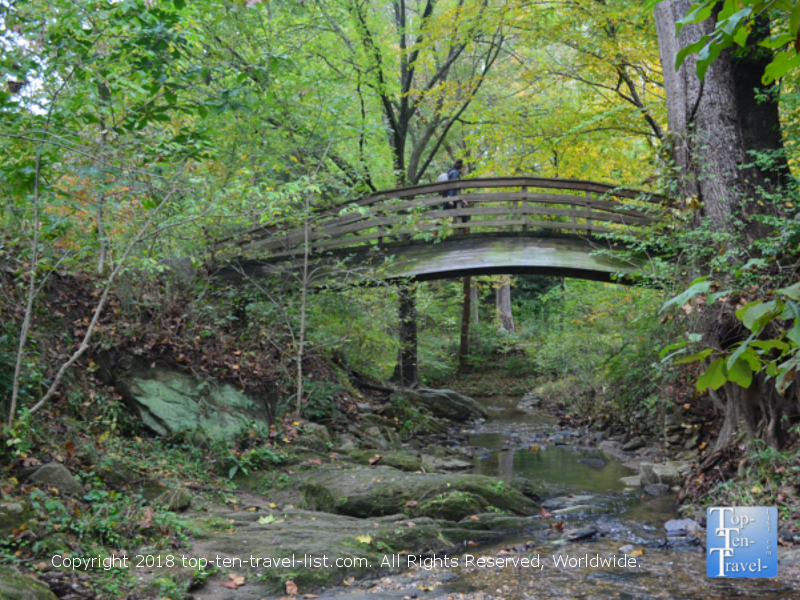 There are several trails to stroll around and it’s never too crowded. There is an on-site gift shop specializing in local goods. The ambiance here is so peaceful – this place is a great escape from the city cluster for an hour or so. The gardens look beautiful any time of the year, particularly during the peak of fall and after a snowstorm. Coffee and cold wintry weather go hand in hand. A rich hot cup of coffee just doesn’t taste the same on a warm summer’s day. The winter season in Asheville is the perfect time to check out one of the local roasters. As it is usually too cold to do much else, now is the best time to kick your feet up and treat yourself to a perfectly brewed cup of coffee. Asheville is well known for its’ happening coffee scene and there are diverse options across town. At Double D’s coffee, you can enjoy your drink inside a unique double decker bus. At Malaprops, you can enjoy treats and locally roasted coffee while browsing endless rows of books. At the Old World Europe cafe, you can enjoy your espresso alongside a rich slice of cheesecake. The best choice of all is Izzy’s, located just outside of downtown in a cozy old house. The coffee here is the best in town and the setting completely relaxed.